The Earth can be viewed as a set of dynamic systems, the atmosphere, hydrosphere, geosphere and biosphere which interact with each other. The largest forces that change our planet’s surface are movements within the Earth’s outer layer in a process called “Plate Tectonics”. 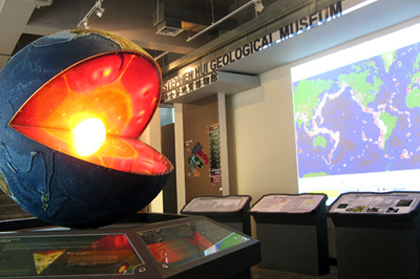 This exhibition includes an interactive Earth globe model of 1.5m in diameter that demonstrates and explains integrated Earth systems shaped and maintained by presently active geological forces. Computer displays will monitor current geological processes displaying real-time data on present earthquakes and volcanic activities within the geosphere around the globe and in the region.